Learn the ins & outs of sourdough bread making with Jess Ross of Gold Island Bakery. This class will explore sourdough bread making, working with different grains & sourdough starters. Learn how to make a reliable sourdough starter. Make a sourdough bread from start to finish. See the differences between rye and wheat based sourdoughs. Explore different flours. Includes a starter to take home! Prerequisite: You have baked a loaf of bread before. 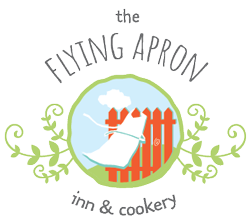 Note: this class will not include a full meal; however Flying Apron Soup will be served with bread & cheese! Detailed written instructions will be provided. Our beautiful Cookery School kitchen is licensed so you may order local beer and wine from our drink list to enjoy during your class. Make it a Culinary Getaway and spend the night in our beautiful Inn! A hot breakfast in our restaurant is included.